So I picked this up for cheap al my local favorite guitar store. 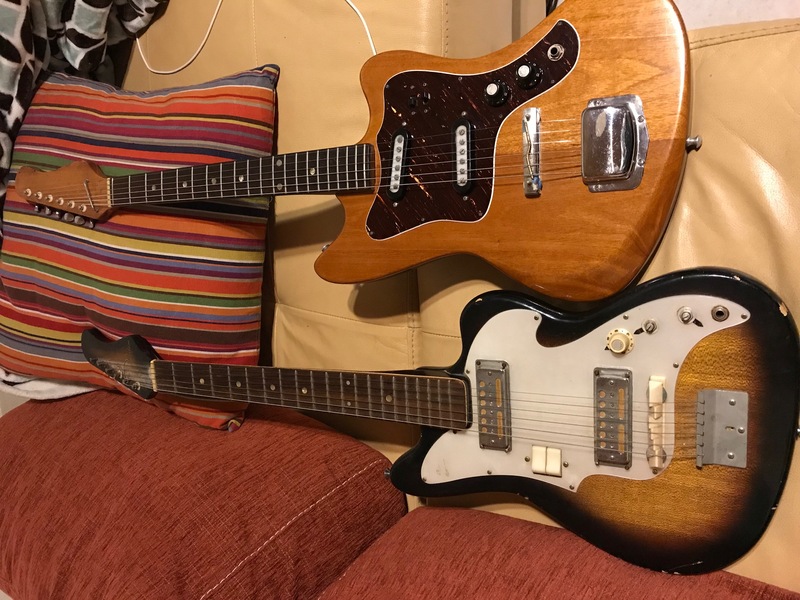 Then know I like old Japanese guitars. So they said, we just got this in, you want it? They said the gold foils work. So of course I got it. 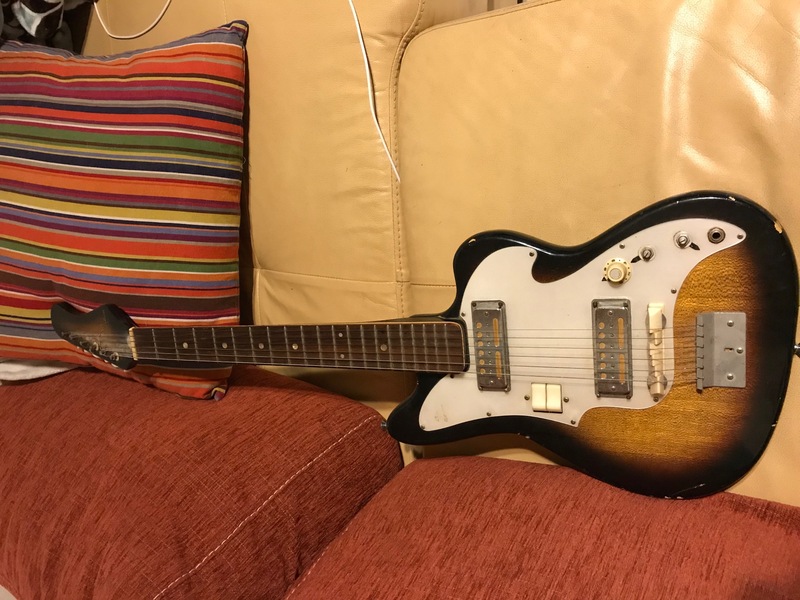 Needs neck binding and missing a couple tuner ferrules (if anyone has onr know a source for the old teisco cream cored plastic ones, let me know). Need a couple vintage cream knobs too. 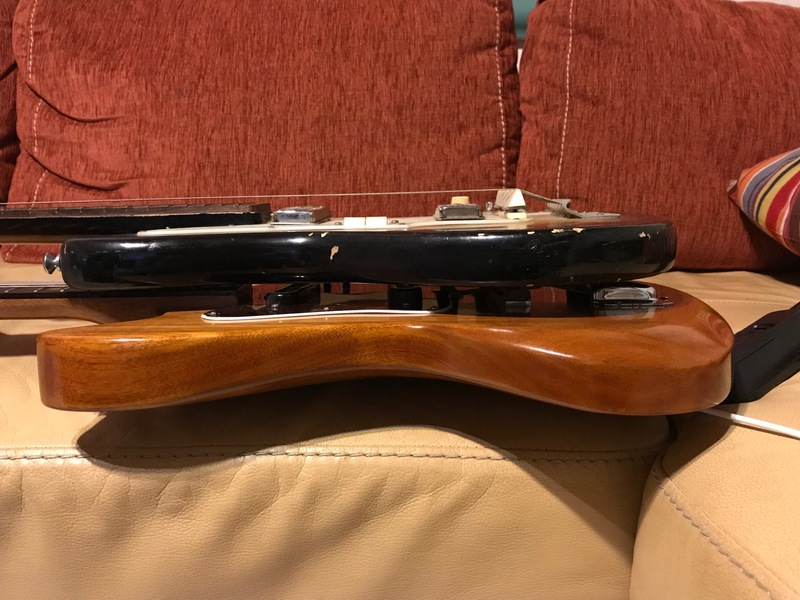 I may make a nice body for it and reuse all the other parts of the guitar like I did with my mahogany body teisco I did a while back. I made a thicker body with tummy and forearm cutouts. You can really see the difference in the thickness of the bodies. The neck pocket is maybe 1/2 inch deep. Love it, check that scratchplate! Usually, overtime, they shrink a bit and it causes one of the screws to break the it. Those pickups can be really good or really bad. My god, why would you want to change that incredibly cool body? Fix the action, rebind the neck and play it as it was meant to be played! missing a couple tuner ferrules (if anyone has onr know a source for the old teisco cream cored plastic ones, let me know). They weren't the same as mine (slightly larger diameter, there's no collar that goes into the peghole and the different material has it coming out a different colour) but once the one was installed it looked legit enough for me. You could always slap all 6 of them on. They're essentially domed plastic washers though, nothing fancy.